districtchronicles students can sell Why Tesol? 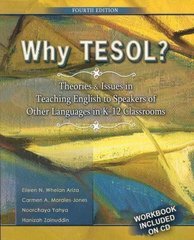 Theories and Issues in Teaching English to Speakers of Other Languages in K-12 Classrooms (ISBN# 0757576273) written by Eileen Ariza, Eileen N. Whelan Ariza, Carmen Morales-Jones, Carmen A. Morales-Jones, Noorchaya Yahya, Hanizah Zainuddin and receive a $16.71 check, along with a free pre-paid shipping label. Once you have sent in Why Tesol? Theories and Issues in Teaching English to Speakers of Other Languages in K-12 Classrooms (ISBN# 0757576273), your Independent , DC Area textbook will be processed and your $16.71 check will be sent out to you within a matter days. You can also sell other districtchronicles textbooks, published by Kendall Hunt Publishing Company and written by Eileen Ariza, Eileen N. Whelan Ariza, Carmen Morales-Jones, Carmen A. Morales-Jones, Noorchaya Yahya, Hanizah Zainuddin and receive checks.